Good morning, darling,” Malle said to me every morning while serving me tea and South African rusks in bed while I stayed with her. It is a lovely South African tradition. She also bought me a package of these biscuits to take home and I think about those delightful mornings every time I eat them. I went to South Africa because my Swedish cousin, Annika, was getting married to Malle’s son, Matthew. He grew up in South Africa, but when he was 16, the family moved to Sweden. South Africa is stunning. 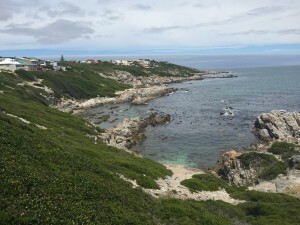 My trip took me to Cape Town and parts beyond, such as the Cape wine lands and Hermanus. The beaches, mountains, fields, olive trees, fruit trees, vineyards, lush vegetation and, of course, desert are simply beautiful. The country has more than 4,000 kilometres of coastline with Cape Town located where the Indian and Atlantic oceans meet. Being in the southern hemisphere, the summer runs from November to February with near perfect temperatures around 20C to 30C. During the height of winter, which is June and July, temperatures can be expected as low as 10C with frost on the mountains. The best times to travel to South Africa are October and November or February and March. December and January, albeit the height of summer, coincide with the South African summer holidays, so expect to see crowded beaches and restaurants. I went in late October and it was beautiful as everything was in bloom. There are 11 official languages in South Africa and many more beyond that are spoken. English is spoken by a vast majority of the population so as a visitor I could get by quite well. Afrikaans, which is a derivative of Dutch, is also common. It is seen on many town and street names, and was a delight to read and helped me to get a sense of the history of European settlement. About 54 percent of the population lives in poverty, and of that group, about 22 percent live in extreme poverty. The contrast between wealth and poverty is stark. The minimum wage is as low as $1 (CDN). I was immediately exposed to the poverty upon my arrival, witnessing some of the neighbourhoods around Cape Town airport. People live in shacks and their bathroom facilities are rows of portables lined up against the fences. Garbage is thrown outside of the fences and goats walk around and eat the garbage. This particular area is several square kilometres in size. Having said this, South Africa is more developed than I had expected. I was told the first heart transplant in the world was performed by Dr. Christiaan Barnard at the Cape Town main hospital. They drive on the left side of the road which felt odd, but eventually I got used to it. Hotels, food and wines are excellent and very inexpensive. The non-tourist areas are even cheaper. My family went for dinner at a restaurant in a small village outside of Hermanus, which is two hours east of Cape Town. Dinner for nine people with one glass of wine each was $80. The first five days I stayed in Hermanus with my aunt, uncle and my cousins in a house on an ocean lagoon of the Indian Ocean. The house was located between the ocean and large mountains. The caretaker of the house took us for a walk and showed us all the flowers. They are more flower species in this small area than in all of the British Isles. In the bay of Hermanus you can sit on land and watch the whales swim just 50 metres out in the ocean. I was told there are usually 250 whales in this bay from September to November. Unfortunately, when we were there we didn’t see any whales. I went with my family to the Aquila Private Game Reserve Safari for two days. It is more than 10,000 hectares and we saw the Big Five (lions, elephants, Cape buffalo, leopards and rhinoceros) and many more animals. We were told that 20 percent of their food is supplied by the owners of the game reserve. I have a feeling the number is higher. The animals were quite docile and overweight. This game reserve is popular due to the close proximity to Cape Town. I got to go horseback riding inside the park, which was very exciting. At one point a rhino and her cub started to run fairly close to us and our group leader became worried. We had to turn around and go back quickly. It was exciting. Annika got married to Matt at La Petite Ferme, which is a restaurant and guest suite on a working vineyard in the “most beautiful valley” in the world, Franschhoek. A room in this century-old hotel costs around $240 per night. It is listed as one of the top 15 “best value” establishments in the world by Condé Nast Traveller. The wedding was beautiful. It was sunny but a bit windy. Everything went well. My cousin asked me to be the emcee as I could speak both Swedish and English fluently. The village has breathtaking scenery, warm hospitality, world-class cuisine, a 300-year history and the finest wines in South Africa. I think I could stay in the beautiful valley of Franschhoek for one month just to eat good food, drink great wines and go on hikes. Many of the top restaurants in South Africa are located in Franschhoek. I was told the finest wines are produced here are because of its French heritage. In the 17th century, the Dutch and British stopped on their voyages to the far east in the Cape Town area to rest and stock up their ships. The Dutch brought French farmers to grow fresh vegetables and produce in the Franschhoek to avoid scurvy, hence the name ‘French Corner’ in Dutch. Sir Richard Branson owns one of the vineyards in this valley. He has 10 properties around the world and two of them are located in South Africa. We went for a wine-tasting tour one day in an open bus tram and train, which I highly recommend. Our tour ended at his vineyard. It is called Mont Rochelle. It had the best Shiraz wine I have ever tasted. Next time I go back I would like to go on a real safari in Kruger National Park or around Port Elizabeth. I also hear the Garden Route is absolutely stunning. I will definitely go back to South Africa and I highly recommend the area that I visited. I have to go back and buy some more rusks.